ONE OF MANY cool things about living in Quincy is parades. I know the Q-Town is big time now that we have a Texas Roadhouse, but still, quaint rules. Dennis and Jeff look good in green. For radio guys, anyway. We have some outstanding parades, from the Veteran's Parade in November to the huge Dogwood Parade in May. 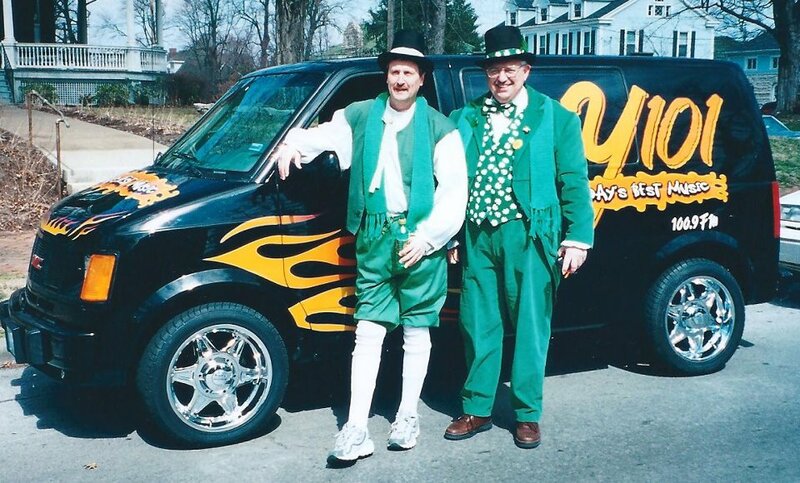 For years, Y-101 radio guys Dennis Oliver and Jeff Dorsey have organized the St. Patrick's Day Parade, and Saturday they lead the prosession down Maine Street yet again. Sure, downtown will be packed and it will be tough to find a nearby parking spot if you want to come to the store. By nearby, I mean within a block. Quaint, ain't it? It's supposed to warm up and hopefully Dennis and Jeff have their usual goofy time. I'll be camped out at Fifth and Maine blowing kisses, jeering political candidates and giving away guitar picks.